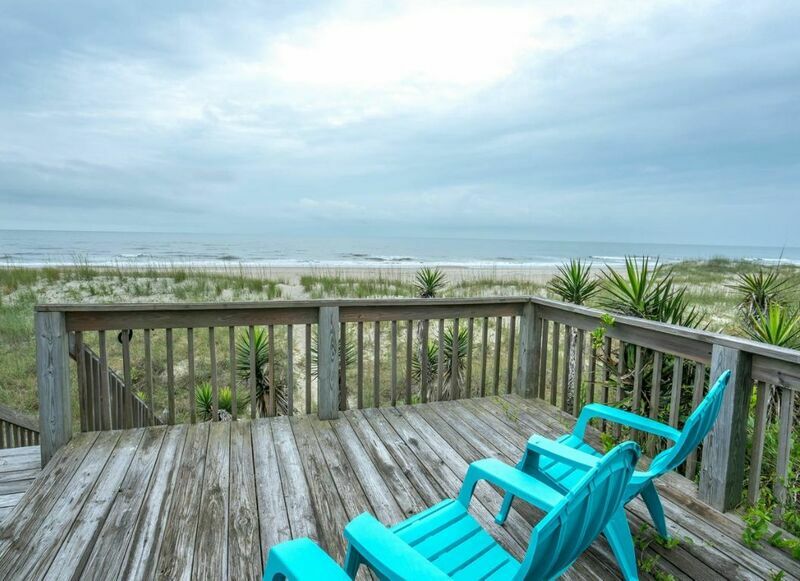 Oceanfront 6 Bedrooms, 3.5 Baths Twin Duplex home. Great for a large group or rent both sides for a family reunion. Desirable location; just a short walk to the town's shops, restaurants, and amusements. Stroll to the pier, the OIB museum or nearby oceanfront community center that offers free children's programs in the summer. Home is furnished to accommodate a large group. Large kitchen, dining area and oceanfront living space. The bedroom sizes fit 2 double beds easily. Large oceanfront windows look out to the ocean from the living area and kitchen. Private beach walkway with a sundeck on the sand dunes. Amenities include 3 Flat panel TV's, DVD player, Fully equipped kitchen with dishwasher, microwave, Washer/Dryer, Wifi, unlimited domestic long distance. Porch Furniture and rockers on sundeck and sundeck on sand dunes. Non-smoking. Sleeps 22. Bedding: Upstairs - King, 2 Doubles, 2 Doubles, 2 Doubles. Downstairs, 2 Doubles, 2 Doubles.